If you’ve been following my blog for a while, you might be familiar with my saying, ‘just because it’s wood, doesn’t mean it’s good’, and that saying rings true in this room – because it ISN’T good, IT’S FREAKIN’ GREAT! And while personally, I have a soft spot for painted and white cabinets, I have to say I’m loving these natural cherry cabinets that we chose for my clients. 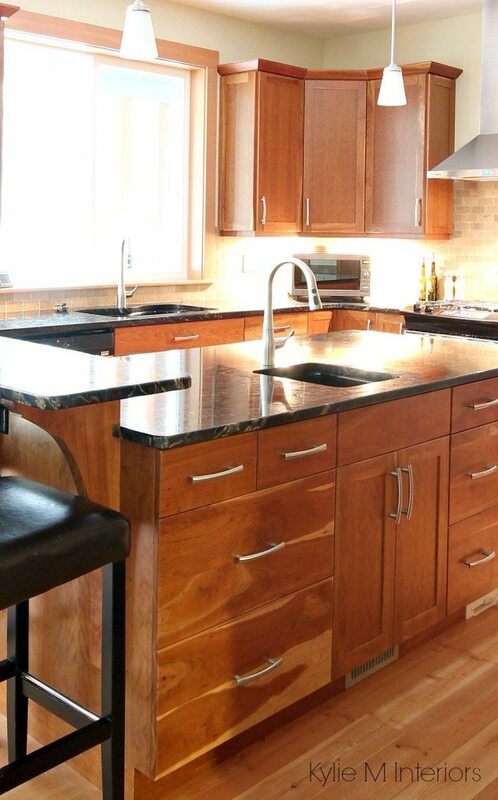 My client had originally hoped for an island with a different shape, but due to the design of the home, we made the best of the space with an 8′ long island with a smaller raised bar at the end. The raised eating bar gives a bit of definition between the kitchen and the family room, which is what the homeowner was hoping for. Contrary to what this photo shows, this room lacks a lot of bright, natural sunlight. 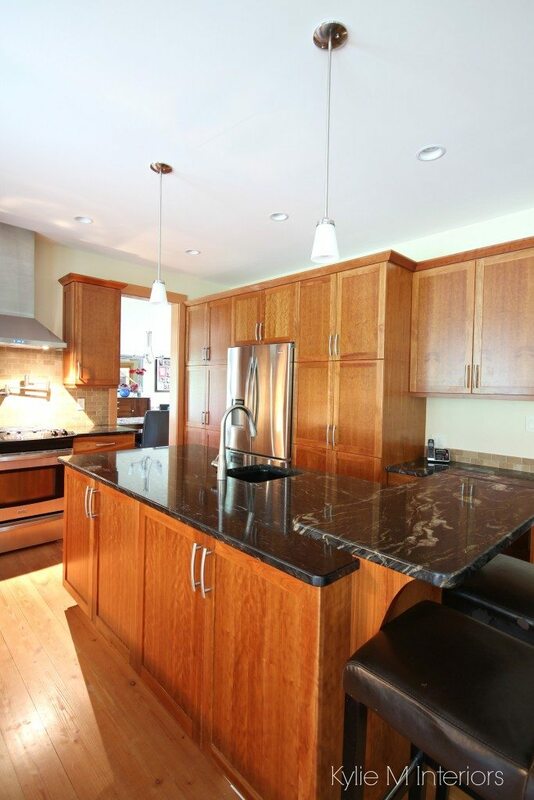 The warm tones of the wood and reflective surface on the granite help to balance this out. This photo is a better representation of the amount of natural light coming into the room (it also shows the paint colour more true to form). 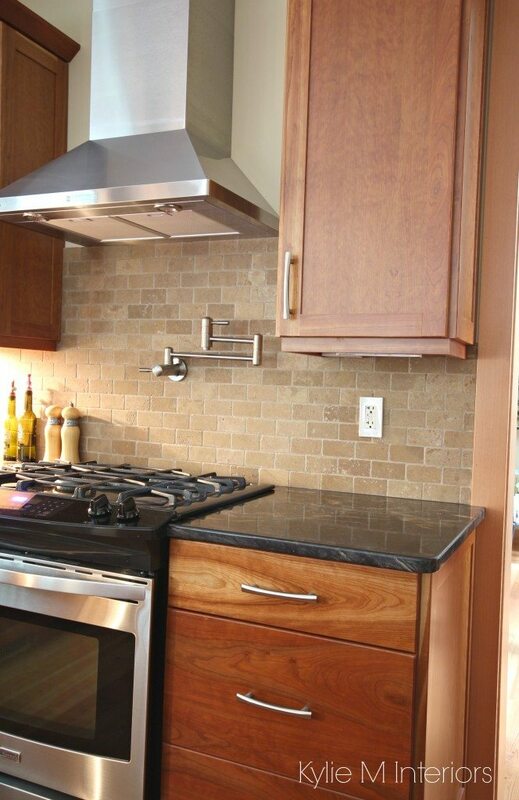 This photo shows how the warm toned travertine tile works with both the black granite and natural cherry cabinets – I’m just DROOLING over the grain on that drawer front! The prep sink is a mini-version of the main sink so that things are simple and seamless. 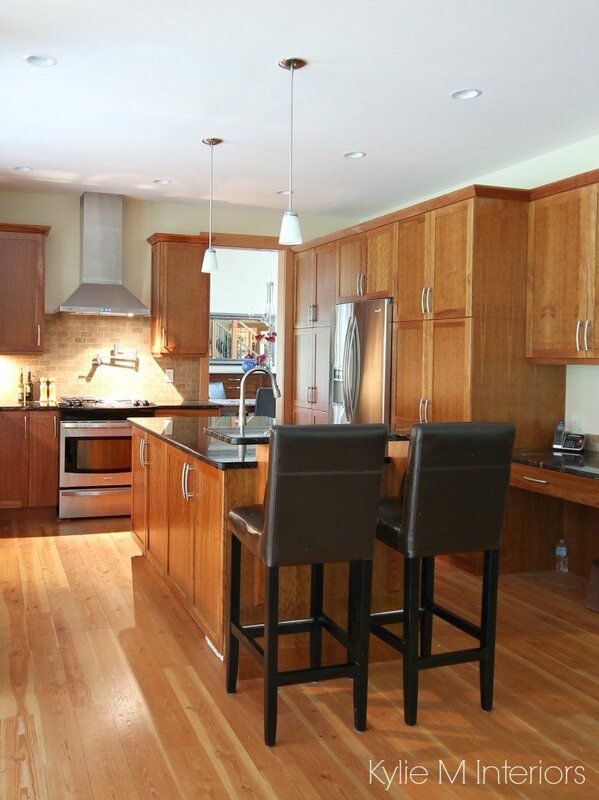 The fir floors look gorgeous with the cherry cabinets. Both products were sealed and left natural – some products just speak for themselves! Want ideas for your own home? Check out my affordable E-design and Online Color Consulting packages! Gorgeous! Love the travertine, too.